Be inspired by the magnetic young principal who “stands on the front line of the fight to educate America's children." (Brandon Stanton, author of Humans of New York ) and the book that Essence calls "Essential reading." In 2010, Nadia Lopez started her middle-grade public school, Mott Hall Bridges Academy, in one of America’s poorest communities, in a record heat wave—and crime wave. Everything was an uphill battle—to get the school approved, to recruit faculty and students, to solve a million new problems every day, from violent crime to vanishing supplies—but Lopez was determined to break the downward spiral that had trapped too many inner-city children. The lessons came fast: unengaged teachers, wayward students, and the educational system itself, rarely in tune with the already disadvantaged and underprepared. Things were at a low ebb for everyone when one of her students told a photographer that his principal, “Ms. Lopez,” was the person who most influenced his life. The posting on Brandon Stanton’s Humans of New York site was the pebble that started a lucky landslide for Lopez and her team. Lopez found herself in the national spotlight and headed for a meeting with President Obama, as well as the beneficiary of a million-dollar campaign for the school, to fund her next dream: a field trip for her students to visit another school—Harvard. Nadia Lopez is the founding principal of Mott Hall Bridges Academy, a model for quality education that includes a safe, nurturing, and innovative learning environment. Since being featured on Humans of New York in February of 2015, she has been profiled in countless national media outlets, has been invited to speak at Harvard, and was invited to the White House, and delivered a TED Talk on the “Revolution of Education.” She is the recipient of the 2015 Black Girls Rock Change Agent Award and the 2015 Barnard College Medal of Distinction Awardee. 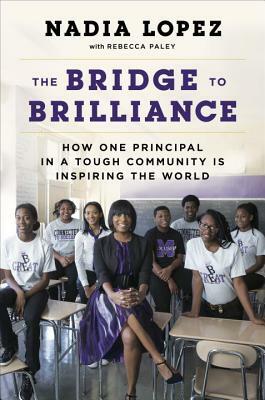 “The story of Mott Hall Bridges Academy is the story of American education. Nadia Lopez stands on the front line of the fight to educate America’s children." "Essential...the key to academic excellence begins with an open mind." "A valuable depiction of what it takes for principals and teachers to reach children in the most troubled communities...will give readers even more reasons to ask what we as a society are doing to support the thousands of educators who labor in obscurity, trying to help the nation's most vulnerable children." "For anyone in education who thinks a student is beyond learning, Lopez's story will prove them wrong. The narrative demonstrates a clear progression from a woman's dream for a model school to that reality, which has made a huge impact in its neighborhood and across the country."